Choosing the right clubs for children is essential for their development and enjoyment of the game. Ill-fitting golf clubs can ruin an otherwise pleasant afternoon on the links or at the driving range, even if you're a child. In fact, this may be especially true for children, because adult golf clubs can often be too long, heavy and rigid for golfing youths. There are several collections of clubs designed for younger players, but there are also several sizes, weights, brands and prices to choose from. Choosing the right youth clubs is an involved process, but shopping thoroughly can make a big difference in your child's golfing enjoyment. Introduce the child to golfing basics. Get out your clubs and explain the different types and sizes. Demonstrate your golf swing and putt technique. By understanding the basics, children tend to be better able to articulate how well suited each set of clubs is for them. Determine your budget. Prices of youth clubs vary greatly, so save yourself some shopping time by thinking in advance about how much you'd like to spend. Take the child to a pro shop that sells youth clubs or, even better, to several pro shops. Each trip will offer the opportunity to touch, hold and swing the clubs before making any purchase decisions. Evaluate the length of each club by having the child hold it and assume a swinging position. Note whether or not the child is comfortable. For an ideal fit, the child should be holding the grip so that the top hand is less than an inch from the end. It's acceptable if the child has to choke up on the grip up to 2 inches. If the child must choke up more than 2 inches, the club is too long. Make sure the club grips are junior grips. Older youths with larger hands may be able to use adult grips without a problem. The best way to determine if the grip is right is simply to ask the child if it feels comfortable and if he can hold the club tightly. Check the shaft material and flexibility of each club. Graphite is lighter in weight, and high-flex shafts allow greater loft, both of which are beneficial to younger golfers. See how comfortably the child can handle the weight of each club. Very young children may struggle to lift and control even the lighter clubs, though most youth clubs are designed with lightweight heads that are appropriate for golfers under 12. Finding the "right" weight isn't a scientific process; if it feels right to the child, then it's probably right. Ask permission to take a few of the best-fitting clubs outside for practice swings, which is usually allowed. 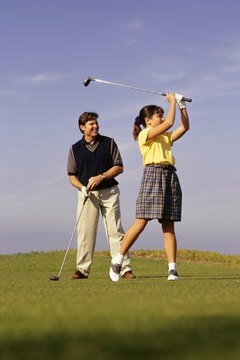 By swinging the clubs, the child may be able to determine which ones feel the most comfortable and controllable. Narrow down the contenders to one or two sets of clubs and ask a pro shop employee for a sizing chart for those sets. If the chart recommends clubs of different lengths than the ones you tried, try the appropriately sized clubs, too. Decide on a set of clubs by evaluating your experiences with the above steps. If you can't decide between the manufacturer-recommended size and what is most comfortable for the child, choose the clubs that are most comfortable for the child. When you've made your decision, buy the clubs from the pro shop or look online to see if you can save on the same set. The best places to look are sporting goods sites, auction sites and shopping aggregators. You'll find examples of all three in the Resources section.